Undoubtedly, the seminal moment where new media became a mainstream source for breaking information was in the hours and days following the cataclysmic events of September 11th. The trove of news and media from the day itself (the 10th anniversary of which approaches in less than two weeks) spans print, broadcast and new media extensively- perhaps the last globally significant story to have so wide a reach in every medium. 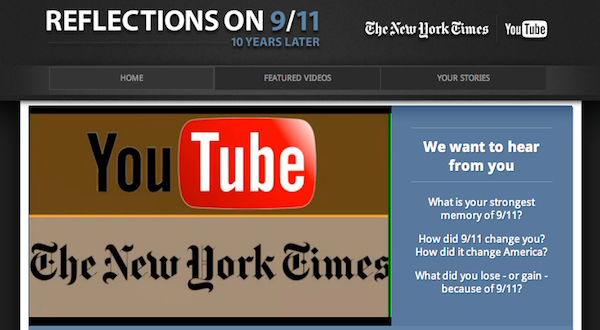 For the approaching decade mark, the New York Times, YouTube, Google and the video-curation service Storyful have pooled content to put together a channel that is a memorial to and remembrance of the events of the day. By joining with YouTube, the Times gains a built-in video-sharing platform; by joining with Storyful, it gains expert curation for the videos it gathers. Both team-ups will likely expand the paper’s reach while also allowing it to tell a story that is, at its core, intensely personal and human. The channel is located here, and is culling submissions from viewers with a story or perspective to share about their 9/11 experience.